The Farah family set up a small factory in El Paso, producing quality blue chambray shirts for men in the early 1900s, giving their products the Farah brand name. Nowadays, Farah offer much more than denim from its London store and extensive online store. Vintage style shows no sign of slowing down in the fashion world, so Farah has brought its legacy into the 21st century with modern clothing encompassing details and styles from history. Men looking to dress with a dapper edge will find shirts, shorts, trousers and accessories to fit their stylish aesthetic. Browse the New Collection, Essentials, Footwear and suits to cover all bases in your work and social life. Men who love fashion flock to Farah to find vintage styles with contemporary twists - making sure heads turn when they walk into a room. 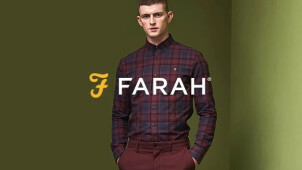 For those who want to jump on the Farah bandwagon but don’t know where to start, head to the blog pages, were the designers at Farah will give you handy tips on what styles are in fashion, which seasons to wear your purchases and how to wear a timeless shirt three ways, alongside loads of other interesting info. Find the best offers for you on vouchercloud. Click onto the Farah website, start shopping. Go to your basket when ready. Click on ‘Have a coupon code?’ text, put code in box, click ‘apply’. Click ‘checkout’, follow payment instructions. Check out the Farah social media channels to be alerted to all sorts of hot-off-the-press competitions, offers and new product launches. Which payment options does Farah accept? Can I track my Farah order? Yes, if you created an account when you made your purchase, you can track your order by simply logging into your account. Does Farah offer a size guide? Yes, it offers guidelines for outerwear, tops, blazers, and trousers on the website. You have 28 days from the day you receive your order to return it back if you’re not happy with your purchase. All items can be returned, including sale items. Farah are not currently able to offer an exchange service. Farah is a menswear fashion brand specialising in timeless, elegant shirts and denim. If you have a Farah discount code, you’d be mad not to use it to make amazing savings on a new collection of jeans, chinos and patterned shirts for next season’s wardrobe. With such great savings to cash in on, it won’t be long till you’re back shopping on the Farah website for some shoes and accessories to go with your new outfits. If you like to be well dressed, but comfort is your priority, then head to the Farah Essentials pages. Leisurewear doesn’t get much more softer or luxurious than a Farah merino wool sweatshirt, or a 100% cotton s-shirt. If a stiff, starchy collar fills you with dread, shopping the Essential collection is a must. You can choose a polo shirt which will look just as smart, but at least you will be able to breath and move more comfortably while wearing it. Farah is known for its slick selection of low-key suits, crafted with tactile fabrics. You’d better use a Farah voucher code to make great savings on a suit for the party season. You can choose from patterns including hopsack, fine tweed and houndstooth. These beautifully crafted garments are minimal, yet timeless, bringing together the past and present to create a refined and modern look.